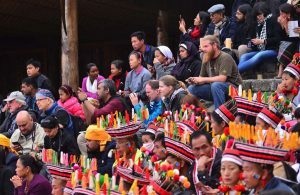 Foreign tourists and visitors, seen here among members of tribal communities, watch a cultural segment of the ongoing Hornbill Festival in Kohima. Kohima, Dec. 5 (EMN): If there is one event that best showcases the rich cultural heritage of Nagaland, it has to be the Hornbill Festival, as all the communities from across the state converge at Naga Cultural Heritage village Kisama to exhibit their unique traditions over 10 days. It has evolved over the years and the number of tourists, both domestic and international, having increased significantly since its inception 19 years ago. “We’ll come back for sure,” said Gunsbourg when asked if they would visit the state again. Most visitors felt that cultural troupes and exotic food are the biggest attractions at the event besides hospitality and ability to communicate with the local people in English. However, they said improvement in needed in some areas like road conditions, transportation system, and connectivity. “It took us some time to get the permit (Inner Line permit),” said Shajean Jaleel from Kerala who arrived at the venue on Dec. 4. Jaleel and his friend Arun JR didn’t have much to say as it was hardly two hours after they arrived at Kisama but they are excited about the happenings at the venue, particularly to relish the famous local rice beer. Jaleel said that they got a homestay without much difficulty. For three tourists from Israel — Yolam, Yael, and Sagi — the traditional and cultural shows reminded them of the Native American. They said this section (traditional and cultural show) was the ‘centre of attraction’. A couple from Mysore, Jordan and Keerthi, said that “food is very good” and were impressed by the “culture” of the land and friendliness of the locals. “English is everywhere, sign boards everywhere, rice beer is very good and people are very hospitable,” they said. However, they felt that the “pathetic road condition” cuts down the plus points. Arushi, Sweta and Sithalika, BSc students from Fergusson College Pune, have been in Nagaland since mid November to get the feel of the Hornbill festival and they said that they were smitten by the ‘mekhala’ (sarong). In city, one does not see anything similar to this kind of tradition, but people in Nagaland conserve traditions and culture very well, they said, adding that the locals are also westernised, keeping a balance of both the local tradition and that of westerners. Meanwhile, the Tourism department has responded to the negative feedback of the festival given by a tourist via an audio recording, which has gone viral on social media. The particular tourist had complained about loopholes in dissemination of information, transport, division of hornbill venues and a few other issues, including email queries on the Hornbill-related website not being attended. However, the Tourism department said that it attended to every single email sent to its lone website www.tourismnagaland.com and that all the information on the festival is on the site. It clarified that the website www.hornbillfestival.com, which the tourist was talking about, is run by an individual based in Dimapur and has no connection with any government department. The Tourism department said that a day has been dedicated to Northeast to let the tourists have a glimpse of the rich culture of the entire region but reports of performers from Kashmir and Odisha coming to the festival is not true. It added that several bus services, including private ones have been put in place to help the visitors, and additional helicopter service has been introduced at a subsidised rates as the road is in poor condition due to the ongoing four-lane works. The department said that local and pink buses ply between Kisama and Kohima every hour, and the service is available till the last tourist leaves late in the evening. Tourist Police are also available round the clock in several locations, even beyond Kohima, to drop tourists to their intended destinations as the festival has been expanded to different locations like Dimapur where music and bamboo carnival are held. “We regret our shortfalls but hope that all will look at the positive aspects and have a Happy Hornbill,” said the Tourism department.